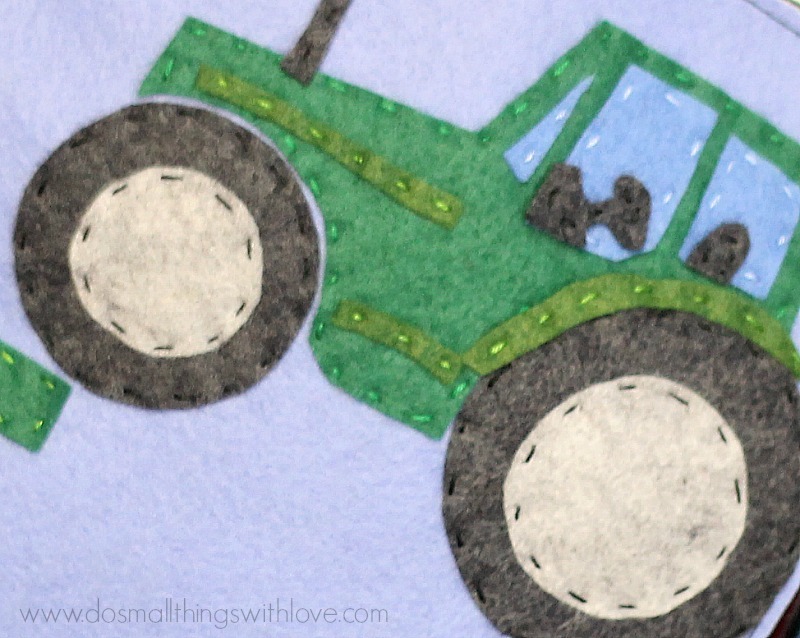 T is for Tractor – Felt Alphabet Book Pattern and Giveaway! Hello Repeat Crafter Me Readers! I’m Nancy from www.dosmallthingswithlove.com and I am so thrilled that Sarah is allowing me to be with you today. Today is a big day for me. 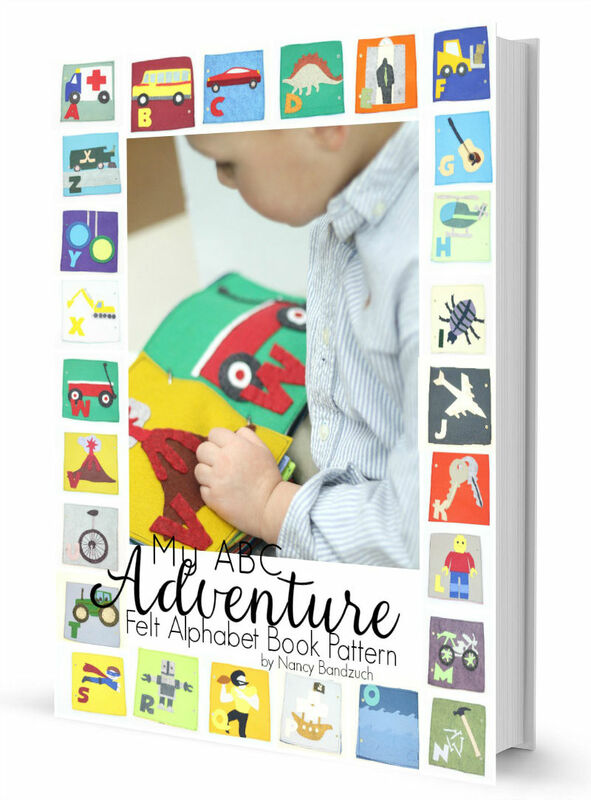 I’m launching a big new pattern–MY ABC ADVENTURE. 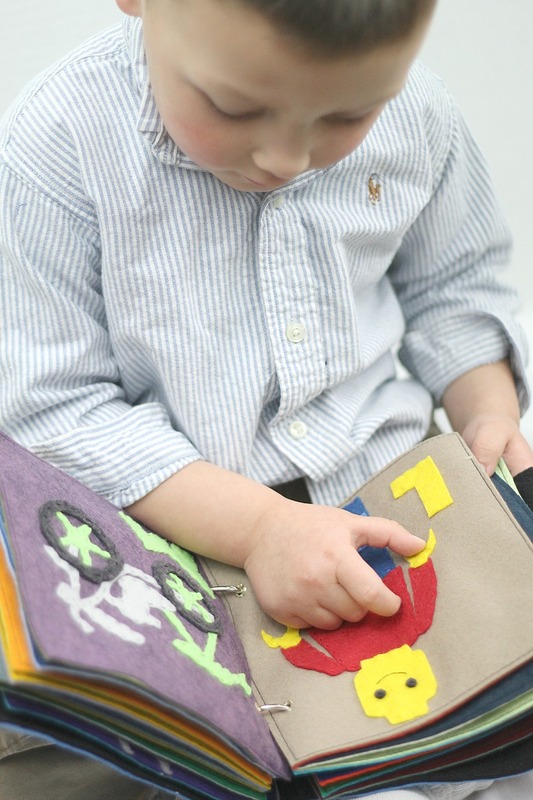 It is a felt alphabet book for boys. Since Sarah and I are both Moms of boys with curious little minds I thought it’d be fun to share about the pattern here–and give you one of the free templates from the book! The entire pattern is on sale for $5 (half price this week) HERE. While creating this book I ran into one major problem–there are too many cool boy words! Like, for the letter “t”, do you go with “tractor” or “train”? A boy alphabet book would not be complete without both of those words. The only solution–you go with both tractor and train! 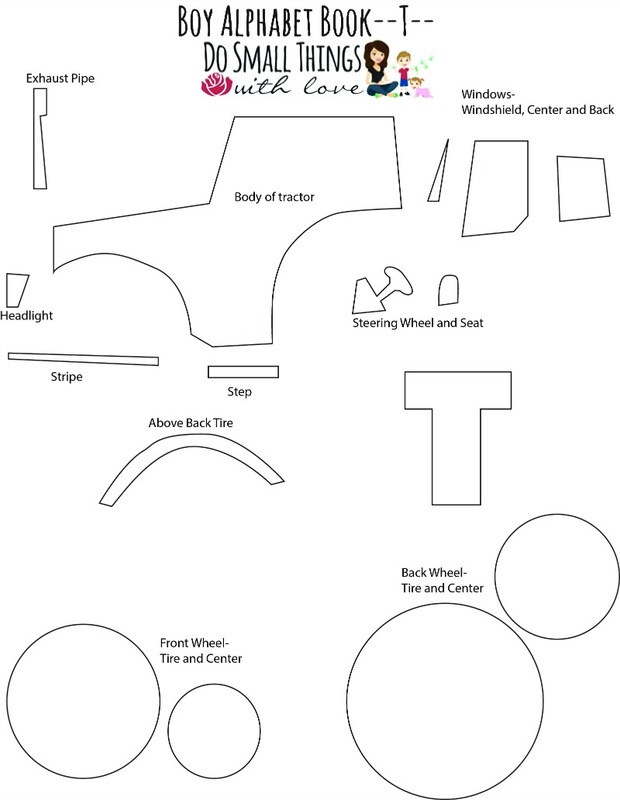 As a result this pattern has 28 to-scale templates and you have some choices as you create! But, today “t” is for tractor! Ready for your free template? Here is the pattern for this page. Click the image for a to-scale PDF of the pattern, ready to print. 6×6 piece of felt for the base of the page. First, cut out your felt pieces. The easiest way I know to get a perfect cut when working with felt is to tape your template directly to the felt you are cutting. Simply cut out the shape on your paper template, then cut a piece of felt slightly larger than the shape you are cutting. Next, using clear tape, tape the paper directly to the felt. Finally, grab some sharp scissors and cut through the tape. This method is much easier and more accurate than using straight pins. Once you have all of your pieces cut out, lay them out. Pay attention to where the pieces overlap. For the tractor page there are a lot of little pieces, so this step is really important. 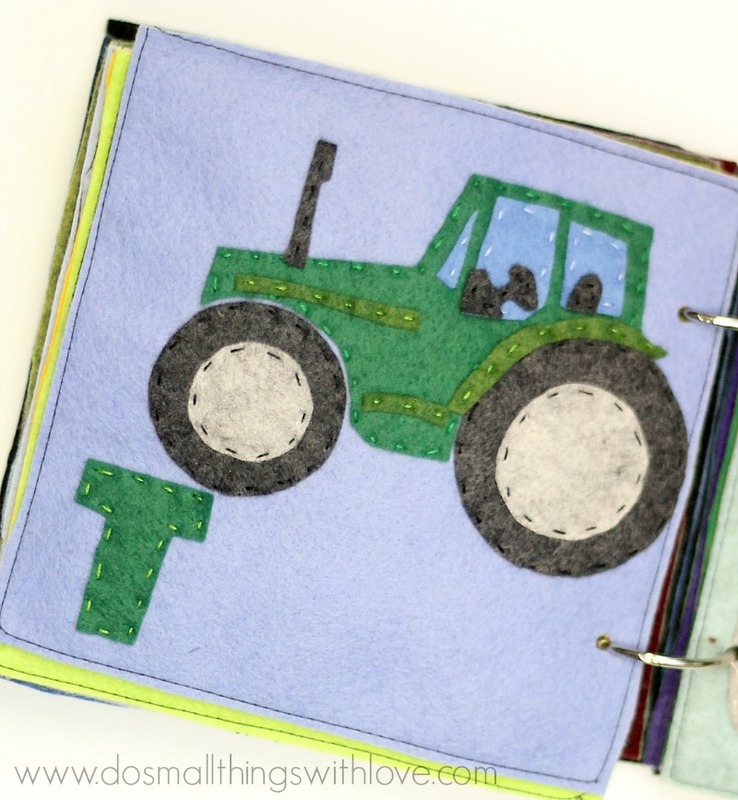 You will begin stitching from the bottom up, so remove the top pieces and begin by stitching the “body of the tractor” piece to the 6×6 page base. After that, stitch down the windows, wheels and other details. The only stitch I used while creating this page is a simple running stitch. The running stitch is the most basic stitch, so this project is great for beginners! For more info on this stitch, check out THIS POST. I should add, if you’d like you can, of course, just glue down the pieces instead of stitching them. If you decide to do this I would recommend using Fabri-Tac, or another permanent fabric glue. However, (and maybe I’m biased) I think stitching is a better option. Yes, it will take longer, but the whole point of this book is to create something beautiful that your little one will cherish for a long long time. Slow down, make it awesome and stitch. Like any crochet project, this alphabet book is a labor of love! “T is for Tractor”, of course, is just one page in the MY ABC ADVENTURE book. There are a couple different ways to bind a felt book and I go into how I bound this book here. 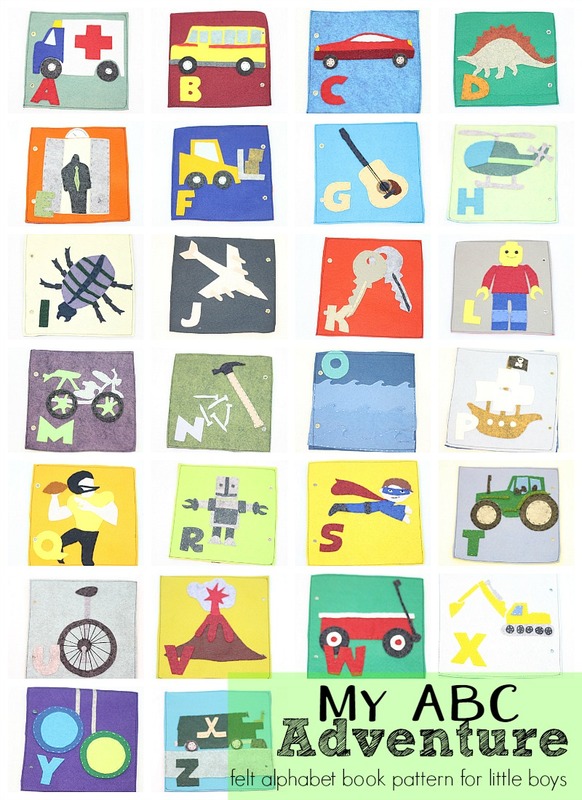 Like I said at the top of the post, I am launching the entire MY ABC ADVENTURE pattern today–and selling it for only $5 (half price) this week and this week only. For more details on the pattern MY ABC ADVENTURE and a little bit about my sweet little boys that I made it for, make sure to head over to my blog and check it out. This is my second felt alphabet book pattern. The first is very girly and called MY PRETTY ABC’s. Because I am so excited about this new pattern I put together a special deal this week and am offering both patterns as a bundle for only $10! Click the image below to get it. Deal ends in one week (4-3-15). And, last but not least, I am thrilled to be offering one reader a FREE BOOK PATTERN (the ENTIRE PATTERN) AND THE FELT TO MAKE IT! All felt is not equal. I like to use a wool blend felt for all of my projects and feel that no one offers better colors and quality that Renae at BenzieDesign. 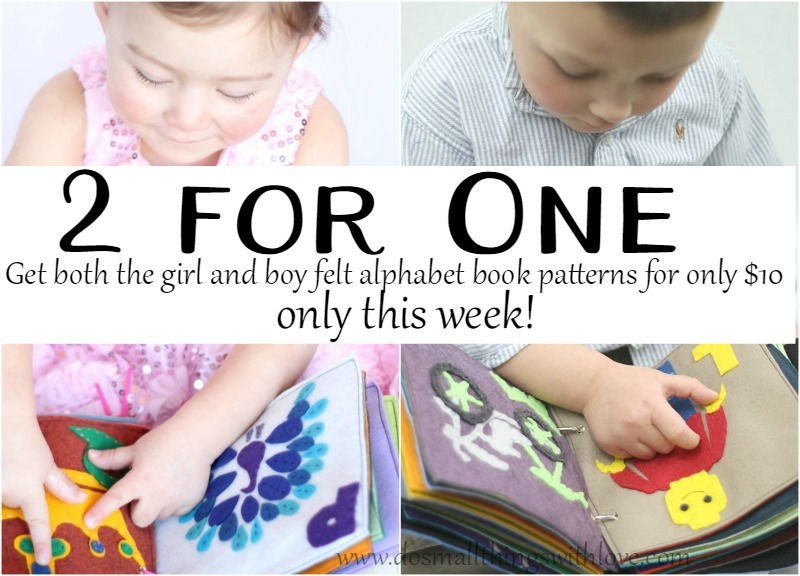 I used her felt while creating my own book and plan to give one lucky reader the pattern for this felt alphabet book as well as $25 credit to BenzieDesign where you can purchase the felt you will need to make your own book! And, all you have to do to enter is sign up for my newsletter where I will keep you updated on new patterns! Good Luck! The giveaway runs through Tuesday March 31st at midnight–so enter now! Thanks for allowing me to be with you today–and so much thanks to Sarah–for today and every day of this blogging journey! Would sure love to win this giveaway!!! Thank you for the opportunity to try for it!! Although trying to sell any omega replica uk observe, don’t neglect in which hardly any folks can afford to getting that. Thus steer clear of emphasizing marketing that inside your local area on your own. Luckily, below are a few a lot more alternatives: craigs list : Many individuals don't enjoy the particular prospective supplied breitling replica uk simply by craigs list. You will promote the Rhublot replica uk observe and also virtually any items of treasured diamond jewelry by means of this web site and acquire affordable sums for the kids. Nonetheless, you ought to comprehend the particular financial obligations with the owner as well as the defense offered omega replica uk in their mind. Honest neighborhood retailers : Vendors regarding tag heuer replica uk timepieces usually favor marketing by means of neighborhood retailers who is able to pay out funds immediately. That’s what we’ve all been waiting for! Great posting!.. I am always inspired by this kind of adorable craftings! Thanks for sharing keep up the good work.